1. 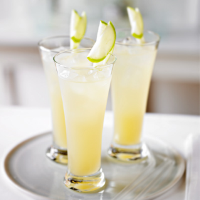 Shake the juices and syrup over ice and strain into an ice-filled sling (or highball) glass, top with the refresher. 2. Garnish with apple slices on the glass rim.